Ayala speaks from a podium placed in the patio of Our Lady of Los Angeles Church, “Nuestra Señora Reina de Los Angeles” in Placita Olvera in downtown Los Angeles. The abuela speaks to the congregation as the first Mass ends and people are leaving the church. It’s Sunday, and together with other abuelitas she is here to participate in voter registration before the November 2nd election. 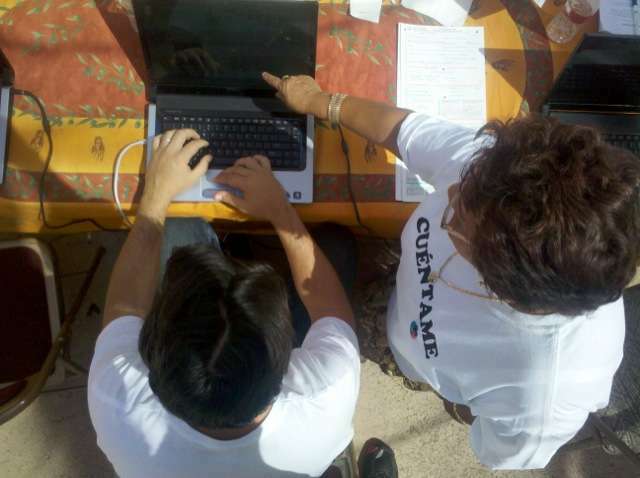 Cuéntame has a double meaning, including “Count Me In” and “Tell Me;” as in, “Tell me a story.” Founded by Caballero and Ofelia Yáñez with support from Brave Film Foundation, its main presence is on the Internet, where its Facebook page has garnered an amazing 43,000 fans after only a few months. Today, however, Cuentame staff is here in person and has brought representatives from a variety of groups and organizations who also want to mobilize the community. Among them, Dale Walker and Marcos Oliva, two of the founders of the group Basta that seeks to fight corruption in the city of Bell and promote the recall of the members of Bell’s city council. Both are young, idealistic and enthusiastic. “We have enough votes to launch the recall,” says Walker, and they laugh, not sure whether they should declare this yet. I notice Jesus from Voto Latino 2010, founded by actress Rosario Dawson and others. Their posters read “United We Win” in English. The heat is scorching, and those offering voter registration complete with pushcarts selling cold drinks and bacon-wrapped hot dogs. Etelvina Villalobos, a Salvadoran activist, is another member of the group. “I am a minister officiating in this church,” she announces, repeating the call for civic involvement. She tells me that during the Mass she will announce the presence of the Cuentame people outside the church. Like the Grandmothers of Plaza de Mayo in Buenos Aires, the Grandmothers of Plaza Olvera are answering the call because they have no other choice. However, they are united not by unending suffering because their sons and grandsons have been disappeared, but, instead, by the hope that members of the community will register to vote and participate in the political process. People begin to leave as others arrive for the next Mass. Soon all the chairs are taken by young people and also, more than once, by another abuelita who answers the call by registering to vote.